A little Eurasian weed first collected in 1959 (Isle Royale) but now doubtless more widespread than the map suggests. 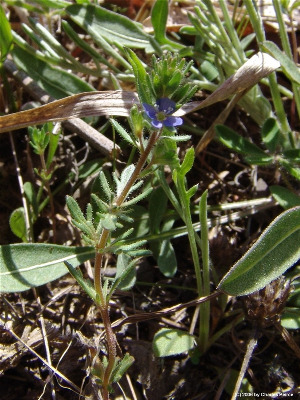 It is easily overlooked, but can be found in dry sandy, gravelly, or rocky bare places in lawns, parking lots, driveways, roadsides, campgrounds, and pineland. Plants as short as 2 cm may bloom. Small individuals with poorly developed leaves (e.g., with only a single pair of basal lobes) are sometimes difficult to recognize, especially when growing with V. arvensis. Sometimes the lobes of the capsule are low and rather divergent (the notch unusually shallow); the style, though still very short, may then about equal the lobes. MICHIGAN FLORA ONLINE. A. A. Reznicek, E. G. Voss, & B. S. Walters. February 2011. University of Michigan. Web. 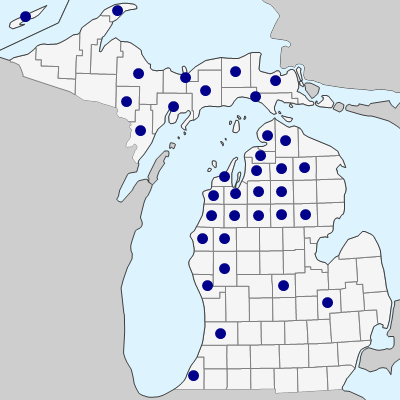 April 26, 2019. https://michiganflora.net/species.aspx?id=1986.